1. 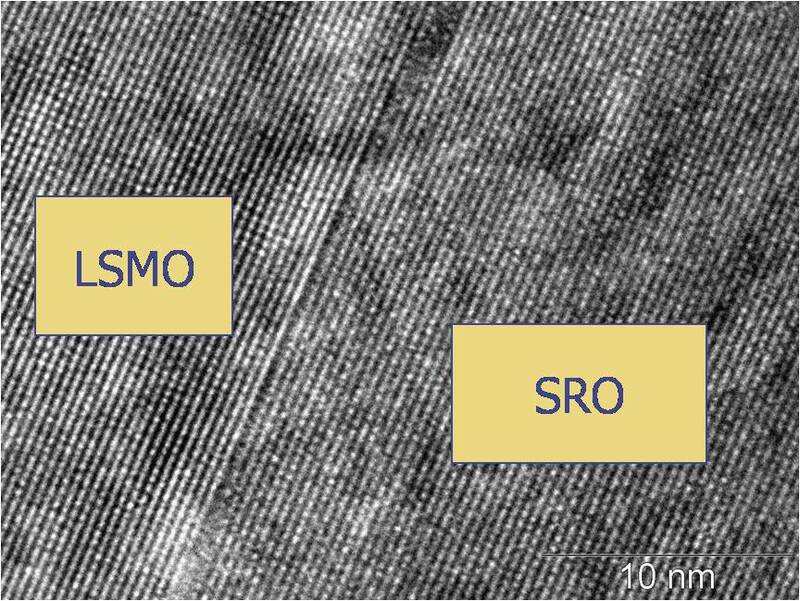 The fabrication technique for epitaxial thin films and heterostructures growth of oxide functional materials such as cuprates, manganites, ruthenates and iridates was developed. 2. 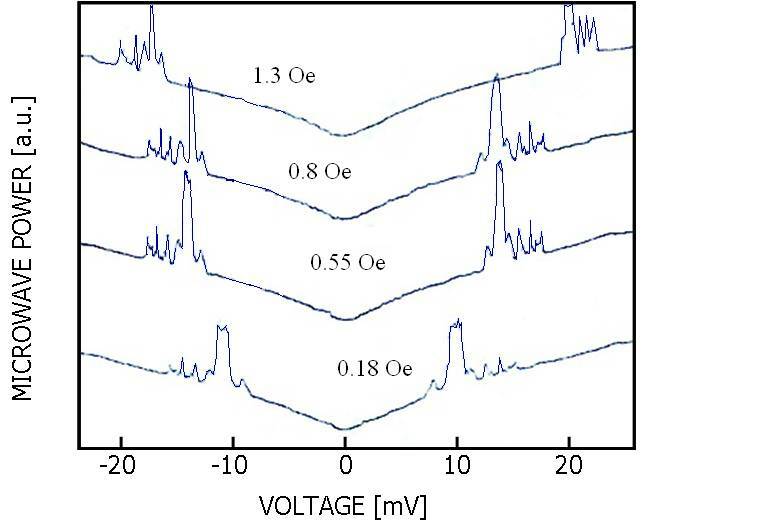 The development of bicrystal junctions and mesa-structures with Nb electrode on top based on epitaxial thin films of functional oxides. 3. 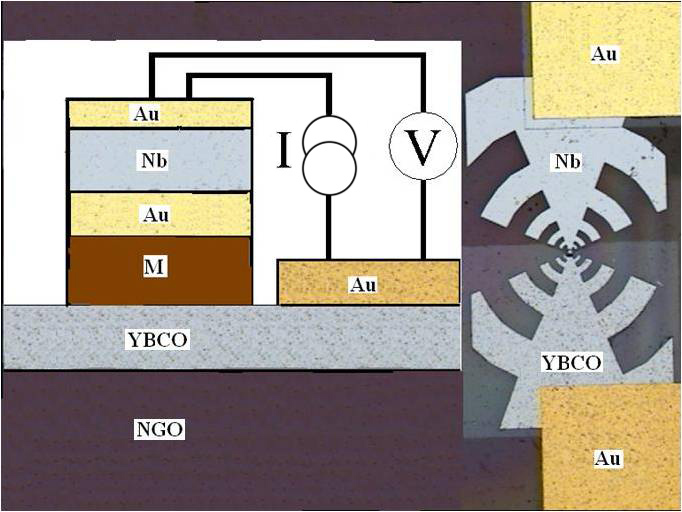 The implementation of resistive, magnetic and microwave studies. 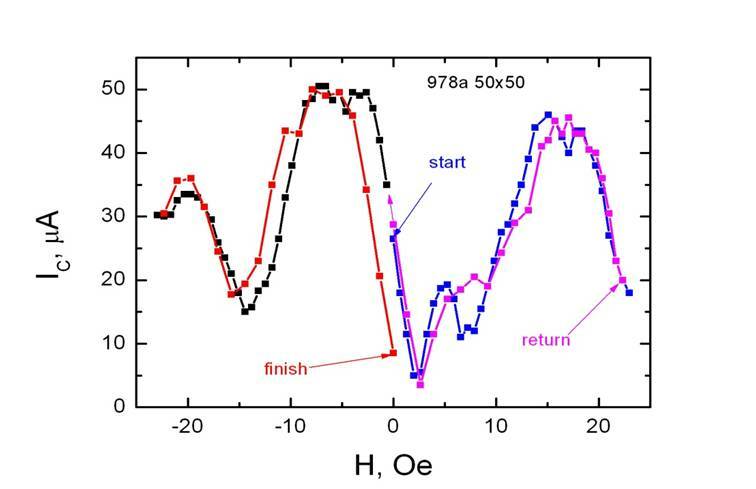 Experimental study of the proximity effect and spin-dependent transport at the interfaces in functional oxides. 4. 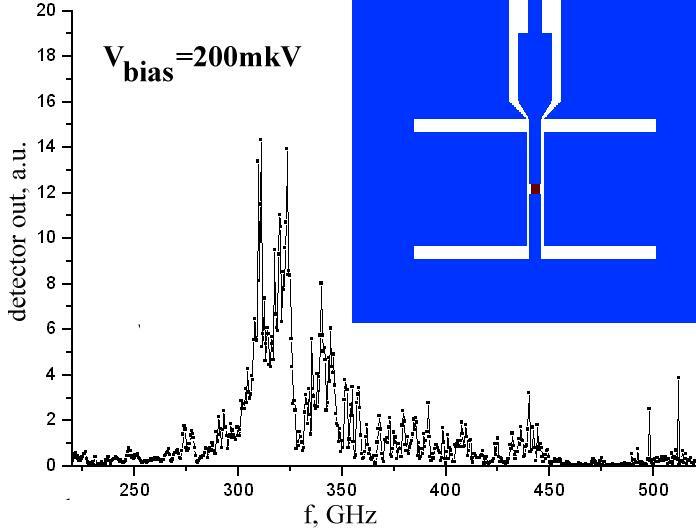 Terahertz application of bicrystal junctions and mesa-structures. 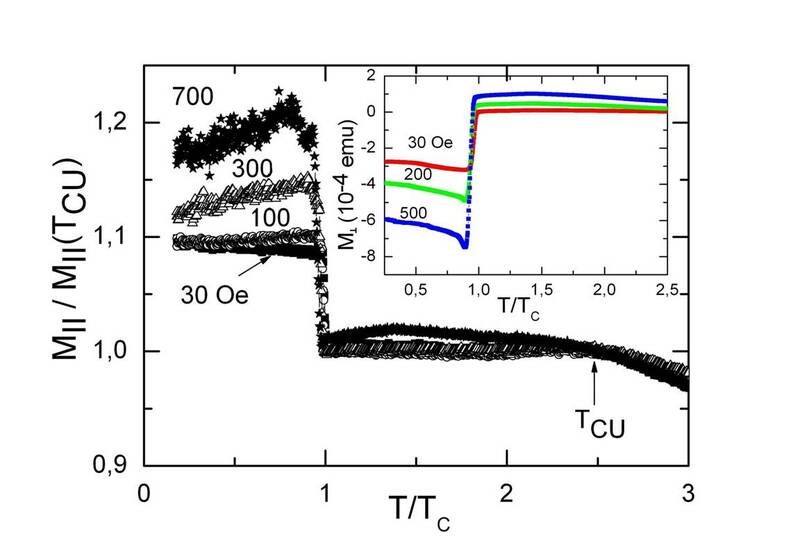 Superconducting cuprate Josephson junctions were prepared on bicrystal substrates for application at terahertz frequencies. Studies were carried out also in collaboration with Armenian academy of sciences (IRPhE) and SRON (the Netherlands). Experimental set-up for measurements at sub-mm waves (in collaboration with IRPhE). BWO – signal source f = 220 – 550 GHz. 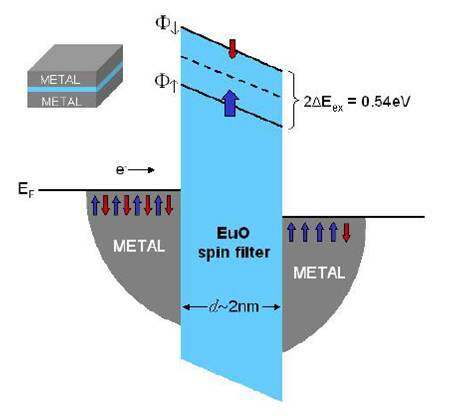 Beam splitter made from metallic net. 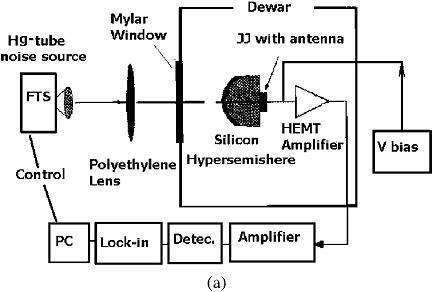 A set of teflon lenses are shown for simplicity in one, the Golay – cell controls input beam power, Si hemisphere lens with d = 12 mm and extension 3 mm, JJ – bicrystal Josephson junction with antenna on sapphire substrate. Detector response on swept signal in the range 220 - 500 GHz. Bicrystal JJ was placed at the broad-band logo-periodic antenna. 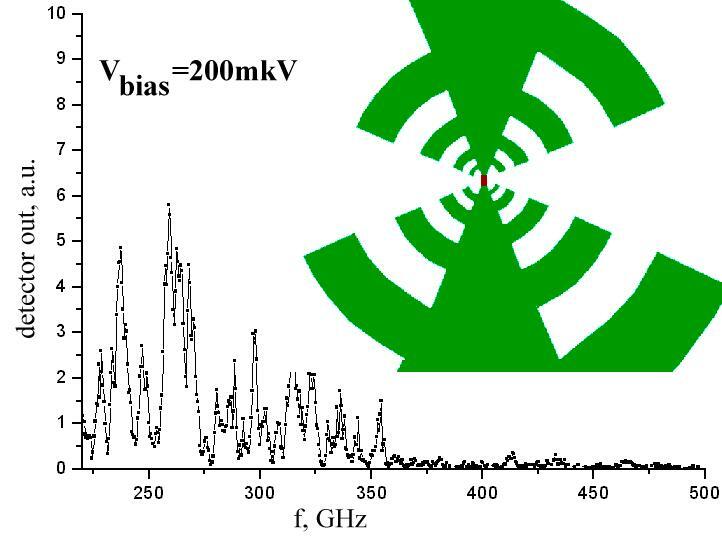 Detector response on swept signal in the range 220 - 500 GHz. 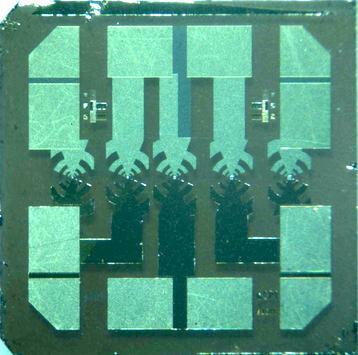 Bicrystal JJ was placed at the double-slot antenna designed for 300 GHz with bandwidth 50 GHz. 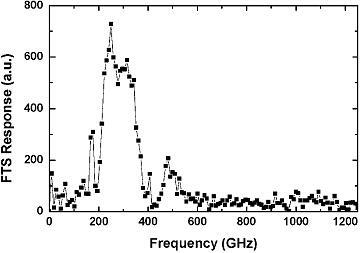 Experimental results of detector response from sub-mm wave signal fixes at f = 450 GHz, registered by JJ detector. Measurements were carried out using modulation frequency F = 32 Hz and integrating time-constant 1 sec. A sketch of sub-mm wave experimental set-up (SRON). 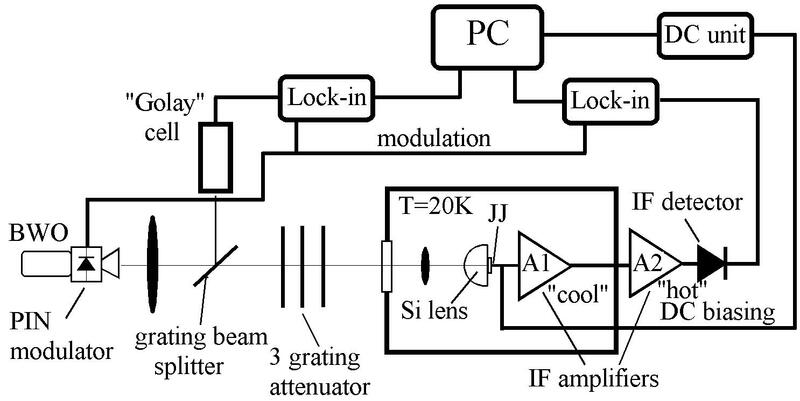 T = 12,5 K, JJ - bicrystal Josephson junction, FTS - Fourier transform spectrometer, Lock-in - selective lock-in amplifier, Detec - detector, V bias - dc bias unit. Signal modulator, temperature control units and reference channel are not shown. 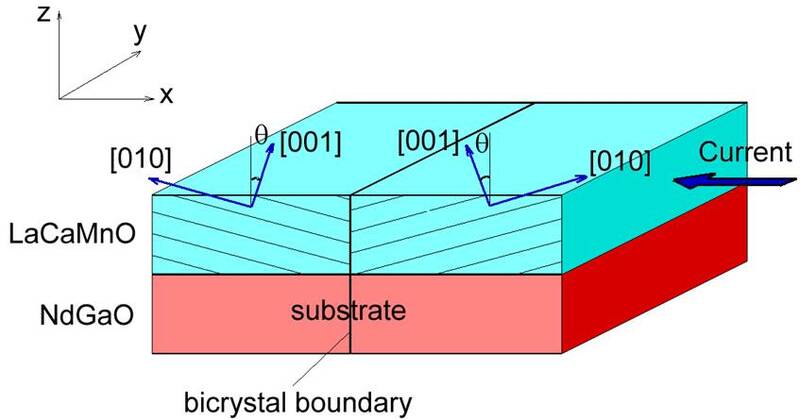 Bicrystal YBCO Josephson junction with log-periodic antenna on sapphire substrate. YBCO is dark. 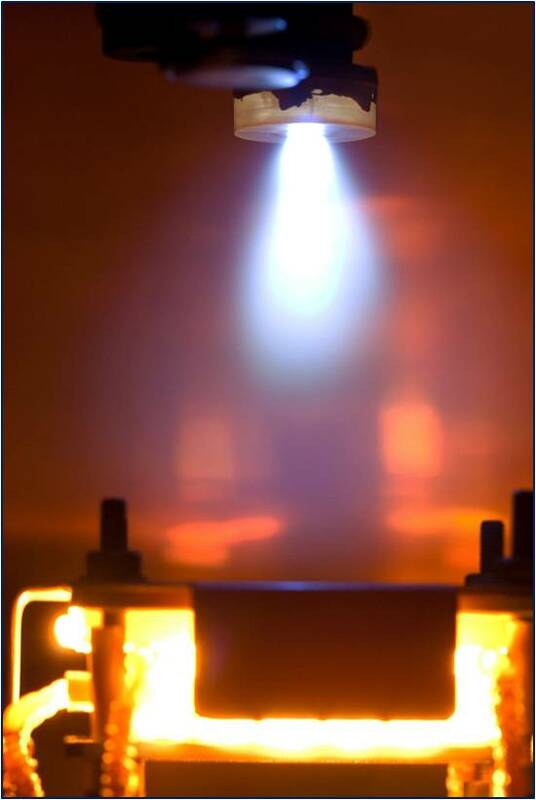 Shining is adjusted to demonstrate a vertical bicrystal line. 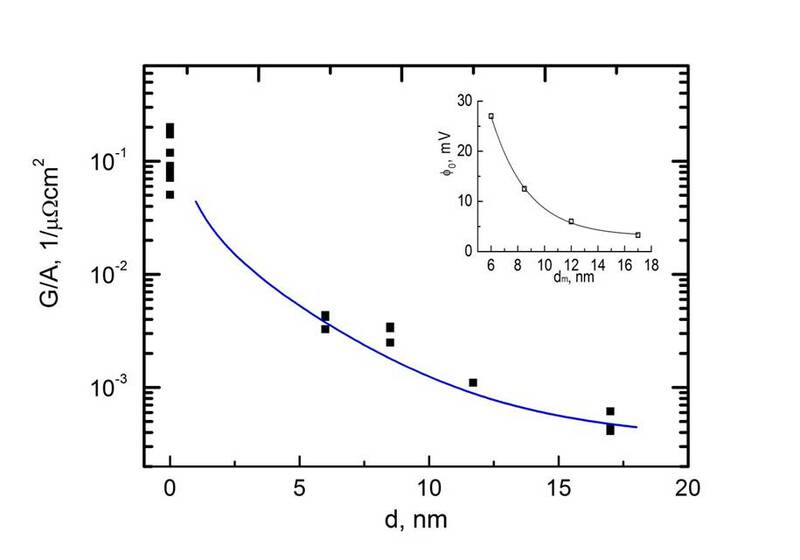 Dashes show scale of 100 μm. Fourier transform spectrogram, obtained from detector response from JJ at T = 12.5 K for fixed bias V = 1,15 mV. 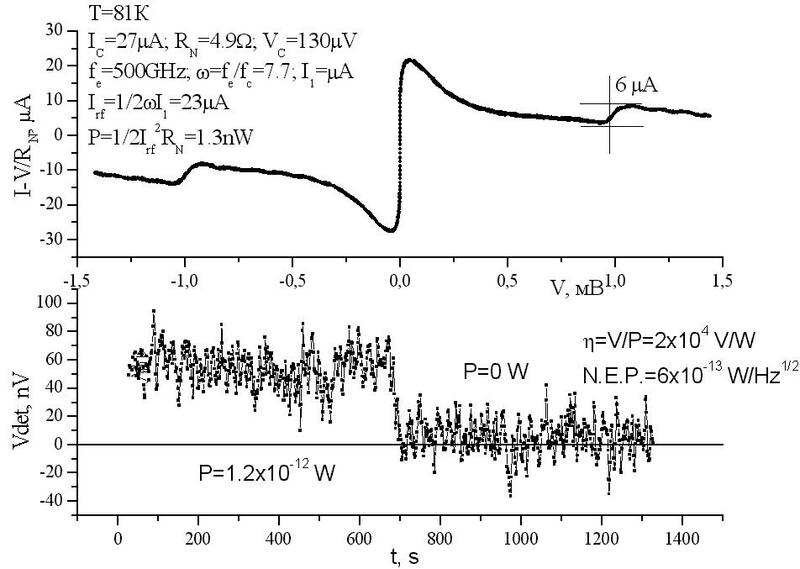 Figure on the left shows the FTS response at intermediate frequency F = 1 – 2 GHz in down-conversion double-side band mixing in self-pumping mode for JJ with normal state resistance RN = 23 W, IC = 90 μA at T = 12.5 K. Bias voltages correspond to pump frequency: (a) 750 GHz, (b) 845 GHz, (c) 970 GHz. 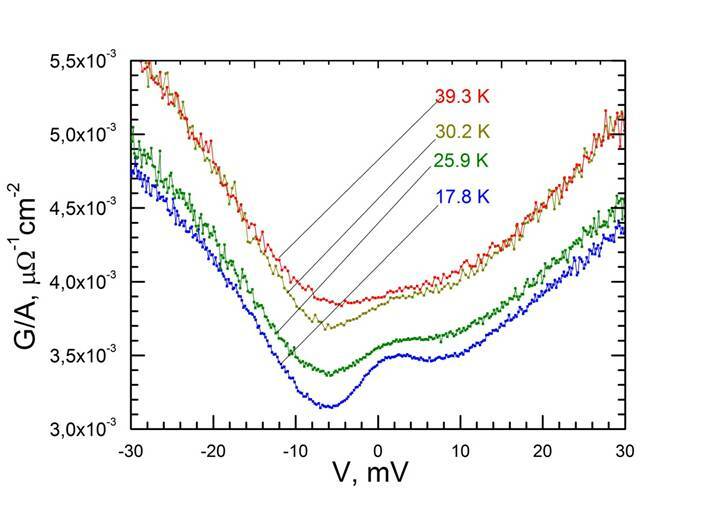 The arrow in fig (c) indicates the frequency of intrinsic Josephson self-oscillation pumping. 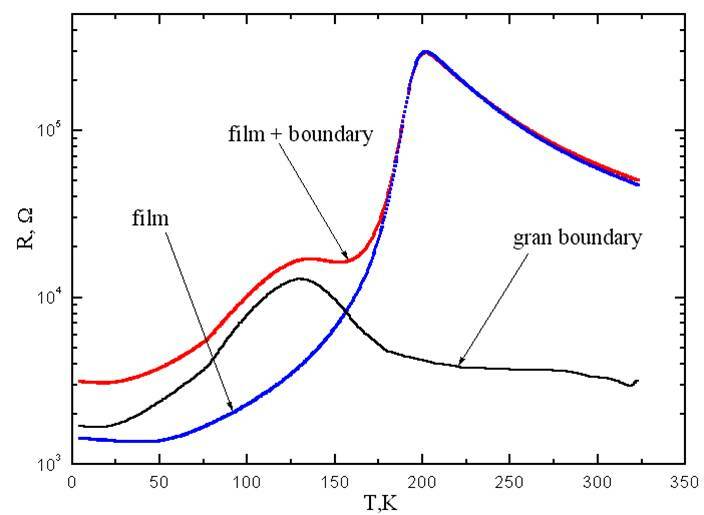 The temperature dependence of bicrystal junction, thin film and grain boundary resistance. Observed decrease of TCu caused, most likely, by the presence of the defective layer near the boundary. 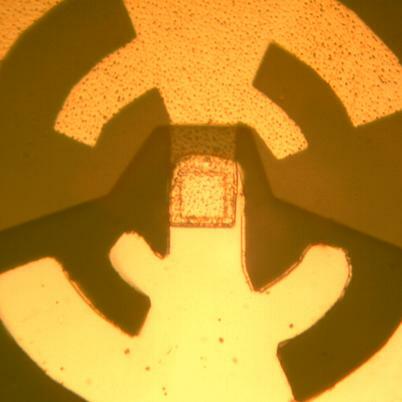 Mesa-structures areas from 10x10 to 50x50 µm2. 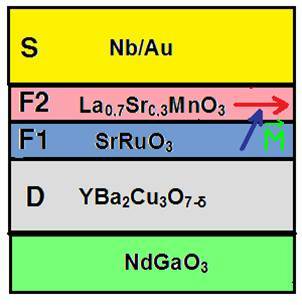 Magnetizations of LSMO is in-plane and SRO is out of plane. 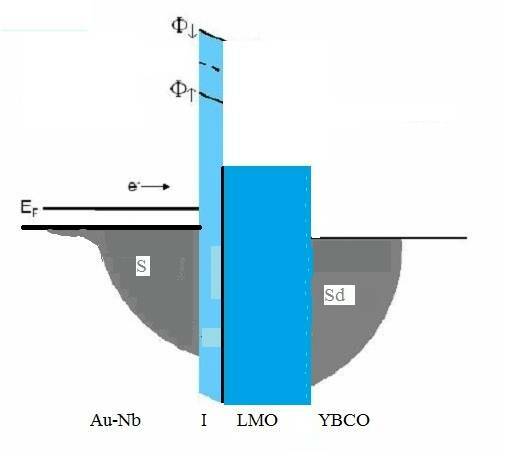 Increasing of magnetization in heterostructure with the only Au film in the top electrode is clearly seen for parallel orientation of magnetic field and the Meissner effect in perpendicular field. Magnetic field dependence of critical current. 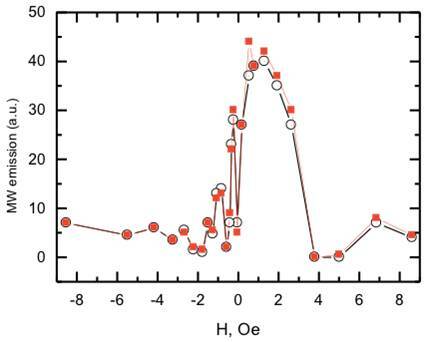 Maximum IC at H≠0 and hysteresis at wider range of sweeping of magnetic field confirms the magnetic nature of interlayer. 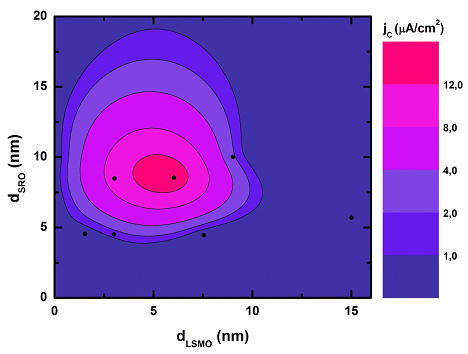 Contour dependence of critical current density jC on dSRO – dLSMO plane. Generation in frequency range 1-2 GHz was measured at bais current I > 150 mA and voltage V ≥ 10 mV and magnetic field ±5 Oe at T = 4.2 K. The line width 50 MHz, power 1 pW. 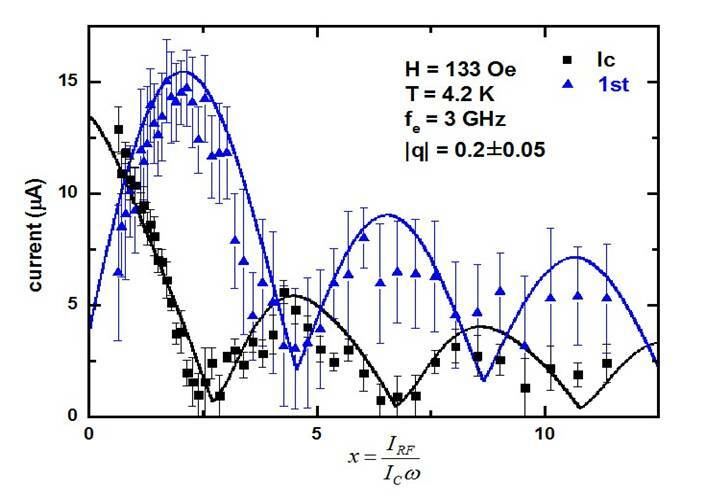 The frequency of generation increases with the bias current as 7.5 1012 Hz/A. The explanation of the generation appear is based on the model presented above. 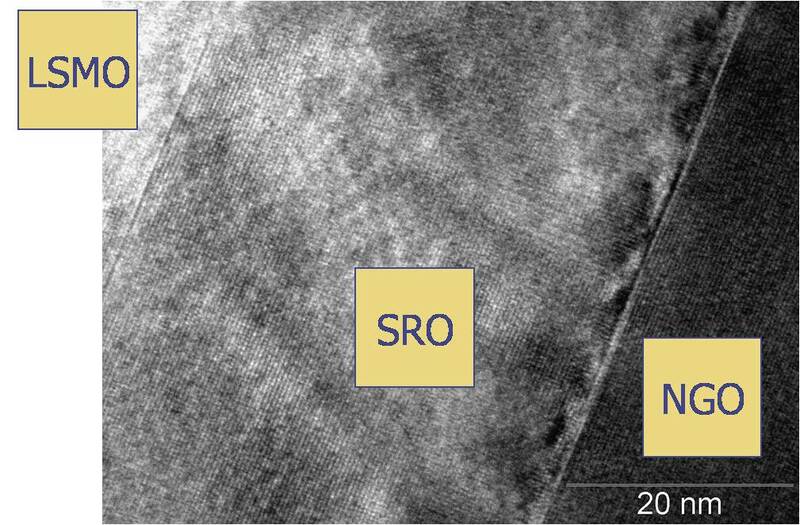 C-parameter of Sr2IrO4 remains close to tabular values, the transition temperature to the superconducting state of the YBCO layer also does not change in comparison with autonomy film, and is equal to 91 K.
- YBCO 60 nm 830 oC 0,5 mbar O2, TC = 91 K.
- Sr2IrO4 10 nm 700 oC 0,5 mbar Ar + annealing 30 min 500 oC, 1 atm O2. 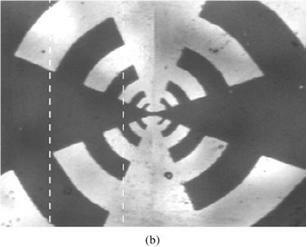 Samples with mesa-structures areas from 10x10 to 50x50 µm2.